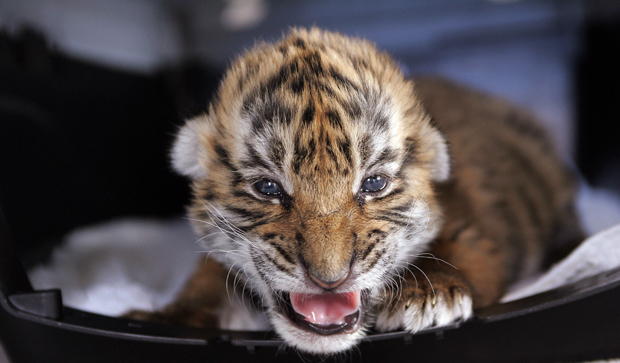 This thirteen-day-old South China tiger cub was the first of his species to be born in captivity outside of China. The male tiger was born on November 23, 2007 at Laohu Valley Reserve in the Free State province in South Africa. By Liu Hongqiao, a reporter for Century Weekly, and Yang Jie, an intern reporter for Century Weekly. This article was first published by chinadialogue. The Laohu Valley Reserve sits on a rolling plain about 200 kilometers from Bloemfontein, South Africa’s judicial capital. In September 2003, two South China tigers were sent to the reserve from a Chinese zoo. What began as an effort to save the species from the brink of extinction evolved into a “rewilding” training project, the goal of which is to release the big cats back into their natural habitat. There are fifteen South China tigers now living in Laohu Valley. Tiger supervisor Vivienne McKenzie said that nine of them are already capable hunters. The South China tiger is exclusive to China and believed to be extinct in the wild. There are only about 100 in the world outside of Laohu Valley, all of which live in Chinese zoos. The original plan was to get those tigers trained in South Africa to come back China in 2008, but the SFA has been unable to find a place to free the rewilded tigers. The idea to send the tigers to South Africa originated with Li Quan, a former fashion executive from Beijing. In 1999 she spent time observing the successes of wildlife reserves and ecological tourism in Africa. A year later, Li and her husband, Stuart Bray, founded the Save China’s Tigers Foundation in Britain. In May 2002, the foundation purchased 30,000 hectares of land in South Africa as a base for rewilding South China tigers. Later, the Chinese Tigers South African Trust was established to serve as the executive organization for the rewilding project and to raise funds. In September 2003, two tiger cubs—Cathay and Hope—arrived in South Africa, making them the first South China tigers on the African continent. A year later, cubs named Tiger Woods and Madonna were flown to the reserve. Then in 2007, an adult tiger—“No. 327”—was sent from a zoo in Suzhou, in the eastern province of Jiangsu, to Laohu Valley to start the breeding program. Raising a tiger is hard, but teaching it to live in the wild is even harder. Over the next decade, more tigers were bred from the first arrivals. But over that time No. 327 died in a fight and the tiger named Hope also died. Later, three more cubs died. From 2003 to 2004, members of the foundation and the wildlife center brought together Chinese and international experts to evaluate seven candidate sites around the country. In January 2004, experts from China and South Africa suggested after field studies that it was feasible to reintroduce the tigers into conservation areas. Eventually Zixi County, in the eastern province of Jiangxi, and Liuyang City, in the central province of Hunan, were picked. (“City” here is a level of government, and such places in China often contain large rural areas.) Those two areas, experts said, not only satisfied the requirements of the tigers for habitation and breeding in the wild, but also had good prospects for environmental tourism. But reintroducing the tigers to the areas has been much more difficult than anticipated. The relocation of the human populations of those areas—both in excess of 1,000—would require approval from the State Council, the country’s cabinet. Changing the zoning status of the land within those regions, currently zoned as agricultural, would require approval from the Ministry of Land and Resources. In the end, the animals did not move. The SFA again organized a panel to choose a site in China in 2010, and three sites were picked: Wufeng Houhe natural reserve zone, in the central province of Hubei; Matou Mountain, again in Jiangxi's Zixi County; and Huping Mountain, Shimen County, in the central province of Hunan. The document also suggested that the Meihuashan South China tiger breeding center in Fujian, in the east, could be expanded for rewilding and population rejuvenation. Three years later, the central government still has not signed off on the three sites. The reason for the delay is unclear, but if officials do finally give their permission, another three to five years will be needed to prepare the sites. Even if fees paid to experts and the costs of relocating human populations are excluded, preparing a suitable habitat is expensive. Brad Nilson, who advises an investment company under the trust for the Laohu Valley Reserve, said the organization has budgeted 180 million yuan for the preparation of a tiger reintroduction zone. Lu Jun, Director of the SFA’s wildlife research center, said the majority of the tiger’s former habitat is regions that have been highly developed. Lu said that renovations to the Meihuashan breeding center will be complete in early 2014, and it will be a rewilding training and population rejuvenation center based on the Laohu Valley model. Yet there were doubts about the viability of the program from the beginning. In the spring of 2003, a group of cat specialists and wildlife conservations under the International Union for the Conservation of Nature (IUCN) expressed reservations about the foundation’s plans to rewild tigers in South Africa. The group said that experience has proven that all reintroduction projects are risky, and the animals’ familiarity with their habitat and local game stocks are important factors behind population restoration. In addition, the degree of inbreeding in domestically raised South China tigers is exceptionally high, meaning there was only limited hope for the survival of a sustainable, diverse wild population. The director of the World Wildlife Fund’s China Species Program, Fan Zhiyong, also had doubts. Historically, a single South China tiger could range over fifty square kilometers, but that area will be difficult to find in Southern China now. Fan also said that Africa’s game populations are dense, but China’s no longer were. This naturally raises questions as to whether the foundation will ever find the space and food in China for the tigers to thrive again. Another point of contention is whether the genetic makeup of South China tigers rewilded in South Africa is pure. Xie Yan, a researcher at the Chinese Academy of Sciences’ Institute of Zoology, says the significance of saving the South China tiger lies in saving its genes. Some at the IUCN say China might be better off trying to save the four subspecies of tiger that remain in the country. Xie said the Amur tiger—also known as the Siberian—that is native to Northeastern China and Siberia is not extinct in the wild. The wild population still had healthy numbers, she said, meaning there is time to build conservation areas on the Sino-Russian border. This is an edited version of an article that was first published by Caixin.